Murillo, Bartolome (1617-82). An artist whose many religious paintings emphasized the peaceful, joyous aspects of spiritual life, Bartolome Murillo was the first Spanish painter to achieve renown throughout Europe. In addition to the enormous popularity of his works in his native Seville, Murillo was much admired in other countries, particularly England. Here his influence can be seen in the paintings of Sir Joshua Reynolds and John Constable, who painted during the 18th and 19th centuries. Murillo was born in 1617 in Seville. 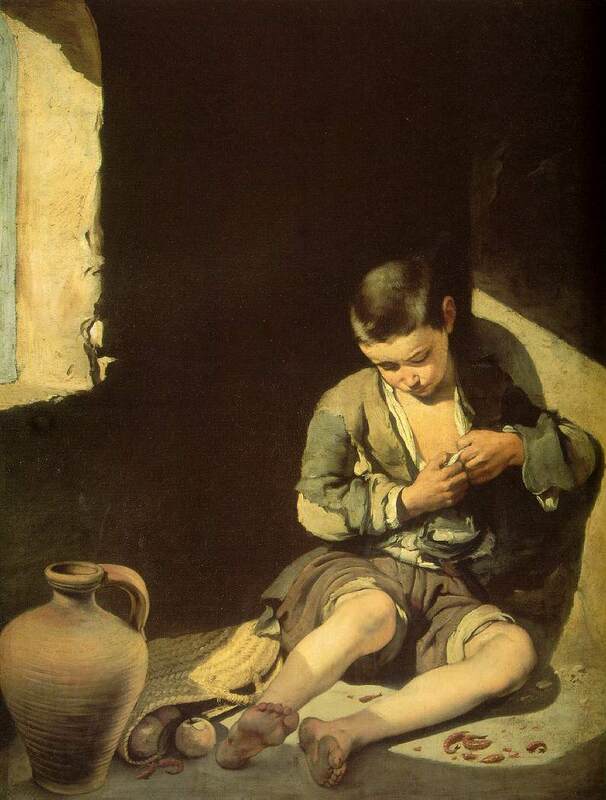 His parents died when he was a child, and he went to live with a local artist, Juan del Castillo. As might be expected, Murillo's early works show Castillo's influence. Under him Murillo learned to turn out religious pictures that were sold to small churches in Spain and in the Spanish colonies in America. At some point in his life, probably in the late 1640s, Murillo is believed to have visited Madrid. In any case, after 1650 his use of color and light and his natural, human portrayal of figures seems to show the influence of Diego Velazquez. In Madrid, Murillo would also have seen paintings by the Flemish and Venetian masters, and the work he did in Seville between 1650 and his death seems to show these influences, too. Because Murillo did not put a date on most of his paintings, these changes in his style are often used to determine the order in which he painted them. Among the pictures painted when Murillo was a youth are several affectionate studies of the ragged boys and the flower girls of Seville. His later works are nearly all serene religious compositions, marked by splendid coloring, great technical skill, and pious intensity. One striking characteristic of these works is the illuminated mist, populated with angels and cherubs, that surrounds the central figures. The few portraits he painted are extremely lifelike. In 1660 Murillo helped found a public academy of art in Seville and served as its first president. In 1681 Murillo was in Cadiz, painting the Espousal of St. Catherine on the walls of the Capuchin monastery there. He fell from the scaffold, and his death on April 3, 1682, apparently resulted from his injuries. Murillo was buried in the church of Santa Cruz in Seville. Among Murillo's well-known paintings are three versions of the Immaculate Conception . St. Anthony of Padua was another of the subjects that he painted several times. Many people like best the series he painted for the Charity Hospital in Seville. Among these are Moses Striking the Rock , St. Elizabeth of Hungary Tending the Sick , and St. Peter Released from Prison .